Have you ever picked up a puzzle book, looked at one of the puzzles and wondered.... How the *** do I even begin to sort this out? And yet, once you've had a go, or had someone show you (much easier), it's no longer a mystery. It maybe even enjoyable. For many business owners, the web and social media can be every bit as baffling as a puzzle you've never seen before. So how do you become a better player? How do you grow your list online? And not just any list, one full of the right kind of prospects — customers and potential customers who are happy to do business with you and pay you what you’re worth? It comes down to strategy. With any finite game, you need a winning strategy. Finding that strategy is part of your infinite game of becoming a better business man or woman, growing a thriving enterprise and making an impact. For those of you who are coaches, consultants, authors, or speakers, you build your business on your expertise in some way, as do trainers, therapists and other change makers. Let’s say, you have a great idea for your product, a passion to package up and sell your expertise and knowledge in a way that others will find relevant and useful. Whether that’s an e-book or a membership site, a training course or some software, you set to work and invest far more time, energy and money in creating it than you ever imagined at the outset. Finally, it’s all ready. Full of hope and promise, you prepare your marketing and sales material. Launch. And…. Not knowing what could possibly have gone wrong, you search frantically for some fancy online marketing strategy or tactic you missed, the secret sauce that will make your product take off. It’s the one those Internet gurus have used to make millions so it’s bound to work, isn’t it? A similar strategy is really common for those of you who sell your services. This is the easiest business in the world to start. You don’t need to write a book, build a product, or do anything except set up your website, hang out your “Open for Business” sign and you’re away. Whatever your skill or knowledge, there are definitely people out there who want it and would be willing to pay for it. You know this, but the going is tough. You start chasing clients at networking events, breakfast meetings. You hustle, you arrange 121s. And win a few customers. Unfortunately, not the ones you want. They balk at your fees — the ones you’ve already dropped so low it hardly covers your expenses. You end up feeling drained and not making anywhere near the impact nor the income that you set out to. This is the impact of taking a traditional approach to your business and your market. And it doesn’t work. I know. I’ve been there, done it. And found a better way. What if, instead of leading with your product or service, you began by growing an audience online? It seems counterintuitive, I know, but bear with me. Begin by giving away some of your expertise. Relax. You can easily do this, by giving the “What” of your knowledge. (Leave the ‘How” for paying clients). We’ll be examining all the ways in which you can build that audience and engage with them over the coming weeks, so hang in there. You’ll give away free content on your blog, social posts, articles, videos, and guest appearances with influencers in your field. You’ll use groups, company pages on your most promising social networks, lead magnets and landing pages and email follow up sequences to nurture and engage with the audience. What I want to do here is make you aware of the many advantages of this particular approach. Let your audience tell you what they want. You product creation or your service offering will be based on real-world demand, not on your hunches. Invite your followers to get involved in the process of creating and marketing your offer. This is co-creation and it transforms someone from a passive prospect into an active partner. More than anything else, this helps you build a product or provide a service that people actually want and are willing to pay for. Your audience will buy it before you create it. Your product first approach gives you little choice but to build something and hope for the best. It’s risky, time consuming and expensive. With an audience of loyal followers, you can pre-sell your offer and get paid in advance. Positive cash flow. Works a treat. You will be selling from a position of trusted authority. Your followers know, like and trust you. They are far more likely to buy from you than someone who doesn’t know who you are. And if they trust you and buy from you, strangers will too, simply because others are buying. If you sell a service…. Clients will come to you. Because your followers see you as the authority, the expert in your field. And when they come, others do too. Your clients are better and happier. You’re already a known quantity, so you don’t have to explain yourself or your services. Nor do you need to convince them. They know exactly what you do and how you can help them. You can charge premium fees. Since you’re the authority, you no longer have to compete with every other service provider or trainer in your field. You’ve set yourself apart from the competition and clients will happily pay top rates for your support and expertise. Those are a few of the advantages of taking an audience first approach to your business. Remember, this is a game, and this game is a whole lot easier with the right strategy. Audience First. We’ll explore other strategies and tactics for playing the Audience First game in future posts. In the meantime, share this with other coaches and consultants, speakers, authors or trainers who could benefit from adopting a fresh strategy for growing their business and their list online. Join me live for a #TechTalkTuesday, every Tuesday at 12:30pm. Every week I share a strategy, tool or tip to make running your business online much easier. Growing your list is a game. Hustling for clients is a game. Not an especially fun game oftentimes. A game nonetheless. So how can we transform this? And instead of chasing after customers, have them show up on our doorstep? It’s a different kind of game. James P Carse distinguishes two kinds of games. Finite games and infinite games. I know it’s enough to do your head in. Simply put, a finite game is one with a beginning and an end; it’s bounded. Like a game of bridge, or chess, football, a general election or a world war. They’re all finite games. And you play a finite game to WIN. Which means there are winners and losers. An infinite game is something different altogether. It has no beginning or end. Not bounded by time or space. So you might be scratching your head and wondering what kind of a game is that? If you’re a parent, you’re playing the infinite game of parenting; a teacher, the infinite game of teaching or educating; a therapist, the infinite game of healing. The game goes on as players come into the game and others leave. With an infinite game there are no winners or losers; just players. You play an infinite game to become a better player — and to help others become better players. How does this impact us? We’re all business owners, playing the infinite game of value exchange, the infinite game of learning and growing. And we’re also playing finite games too. The game of growing your business, of growing your audience, of growing your list can all be seen as games worth playing. Ones where you get to be a better player AND win. There are strategies for playing the game of growing your list. If you’ve been struggling with this, then it’s possible you’ve been using a strategy that isn’t working. In our next session we’ll be considering a couple of strategies for playing this game. Ones that work, provided you’re willing to play full out. See you then. In the meantime, share this post with those you know who want to grow their lists without a lot of hassle and frustration. I’m a great proponent of the Pareto Principle, more commonly known as the 80:20 Rule. It’s a seemingly universal principle that 80% of the wealth is held by just 20% of the population. That’s what Pareto observed. For your business, you get 80% of your results from 20% of your effort. 80% of your revenues from 20% of your customers, 80% of your traffic from 20% of your traffic sources. 80% of your complaints from 20% of your customers. The list could go on and on. Most of us know this principle at the superficial level. But truly understanding it and applying it powerfully can cause dramatic improvements in every area of your business. You see, the real power of the 80:20 rule is not 80:20, though this does give you tremendous leverage. It’s the fact that you can apply it over and over again to the same area and exponentially increase your impact. Let’s take your ad campaign as an example, and say that 80% of your Leads come from just 20% of your Ad Spend. That means that your best performing ads aren’t 50% better that your average ad. They’re beating your average ads by 16 times! It’s a 16:1 improvement. That's why it's good to set up an ad campaign with at least 10 ads and run it to see which ones bring in the most leads. Typically 2 in 10 will outperform the others by a considerable amount. Track your metrics, hone in on that 20% and improve upon it. The power of the 80:20 rule is that you can apply it again, and again and again, until you run out of numbers. Here’s how it works. By applying the rule a second time, 20% of your 20% of Ad Spend results in 80% of 80% of your Leads. 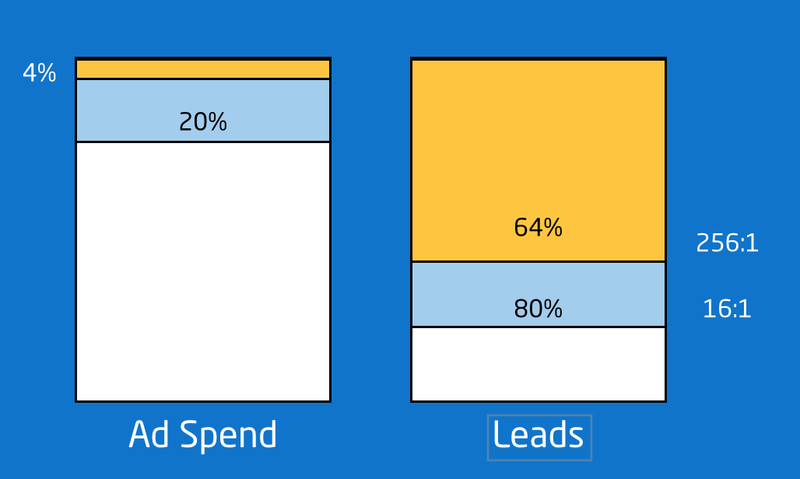 Or 4% of your Ad Spend gives you 64% of your Leads. This means that these few ads are outperforming your average ad by 250:1. A huge improvement. Knowing this, you can home in on those ads and forget the rest. Leverage the best. We could go on and leverage the 80:20 rule again and again until we run out of numbers. But that isn't practical. Honing the 20% is. It's not just getting more visitors to your site either. Or leads into your pipeline. It's converting them to customers. That's another place to apply 80:20. We'll look at that another day.